At the theatrical launch of his film Once Upon A Time In Mumbaai Again, Akshay Kumar made a dramatic entry in a vintage car while co-star Imran Khan came on a motorbike. Leading lady Sonakshi Sinha arrived with her mother Poonam. Jeetendra and Tusshar made up for the absence of Ekta Kapoor, the film's producer. Director Milan Luthria is also spotted. 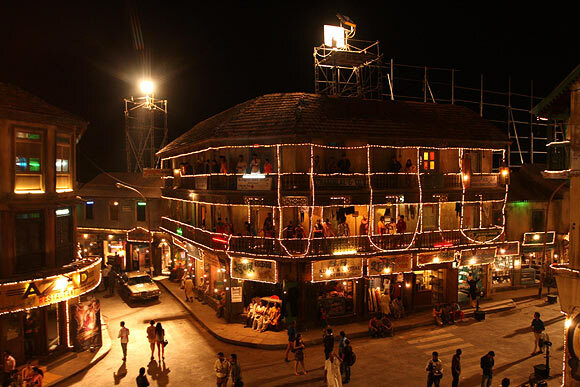 The media was invited to the sets of the film, erected at Film City in Goregaon, a western suburb of Mumbai. The sets the mood of old Mumbai with dingy bylanes dominated by chawls and small huts -- a typical South Mumbai Muslim ghetto. Dressed in the costumes they wore in the film, Akshay, Imran and Sonakshi enacted a scene from the film at the start of the event. As one enters the sets, an old Mumbai charm waits for you. Suddenly, it feels you have traveled back in time. The narrow lanes with, shops, trading houses, restaurants and street vedors with residential apartments above them make you feel as if it is a real place. The set was lit up with lights and looked real, as crowds cheered from rooftops as the stars made their entry. A sequel to the 2010 hit film Once Upon A Time In Mumbaai, the second instalment shifts the focus to the romantic angle. Commenting on the film director Milan Luthria said, "I made the film because writer Rajat Arora came with a fantastic story that I couldn't refuse. The first part was about a power struggle. This time, as the tag line and the trailer suggest, it is a love triangle." It was easy to recreate the old charm of Mumbai, he said. "For me, it was easy to go back in time but I had to have a contemporary touch. Otherwise, it would have been boring. It has to have the pace of today." Akshay Kumar was surrounded by the media as he entered the sets in a car. The 45-year-old-actor takes the character played by Emraan Hashmi in the first instalment, forward. He shrugs off any comparisons. "I am just playing my role. I haven't thought of anyone as a benchmark nor do I think of setting it. I just listened to my director. I never thought that I had to cross any benchmark." Shah Rukh Khan's Chennai Express opens on the same day as Once Upon A Time... , on August 8, the day of the Eid festival. Akshay dismisses rumours of a war between Shah Rukh and him. "I see this in a positive way. Eid is a big day. It is big enough for two films. There is no point in thinking too much over it." Imran Khan, who plays a gangster for the first time, said that he based his character on veteran actors in the industry. "I based my character and the mannerisms on the heroes of the mid-1980s like Anil Kapoor and Jackie Shroff." He is not concerned with projecting any image, Imran said. "I never think of my image. I only think about the story. When the script comes to me I look at it from the audience's perspective and think whether they would want to watch the film."